Get set to shoot spring! May issue of N-Photo on sale now! Spring has sprung! And as we photographers come out of hibernation, so does the wildlife – and wildflowers. So we’ll show you how to capture your best-ever shots of the new season and everything it offers, from flora and fauna in your backyard and local neighbourhood, to shady woods, open fields and coastal scenes. Our Apprentice learns to add a lifestyle feel to landscapes by placing people in the scene and shooting handheld, without a tripod in sight. Nikon Ambassador and music photographer Conor McDonnell tells us how blagging a press pass kick-started his career, and how he has evolved to photograph wildlife, as well as the wild men of rock. We put fast medium-telephoto zooms to the test, concentrating on the ever-popular 70-200mm workhorse, but with a few other focal lengths thrown into the mix. We try out six LED panels for lighting stills and video, and give Tamron's second-generation 15-30mm f/2.8 G2 wide zoom the review treatment, to see how much of an improvement it is over its predecessor. We also have a great selection of projects for you to try, from shooting pets in motion to mastering key and fill studio lighting techniques – plus give away the fabulous Photo Retoucher 5.0 for free! 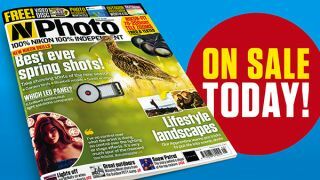 Plus this issue also comes with a bonus Outdoor Landscape and Nature Photography ebook, packed with inspiration for shooting the great outdoors.